Over the past 20 years, I moved at least a dozen times, each time inheriting a yard overgrown with weeds. As a consequence, I am extremely familiar with the challenge of eliminating weeds and bringing old, overgrown gardens back to life. Although the fastest way to combat weeds may be with regular chemical applications, I prefer chemical-free gardening. Undoubtedly, it will take more time, but I believe it’s worth the effort. My first spring in Gunnison, my yard was so filled with bright yellow dandelions that I considered making dandelion wine. That was just a fleeting idea. I have always enjoyed a green lawn highlighted by colorful flower gardens, so every evening after work I attacked the weeds one by one with my dandelion digger. I would not quit until I filled at least five grocery bags. A month later I reseeded and applied “Gunnison Gold” — a compost mixture of nitrogen-rich municipal sludge and carbon rich wood product waste. Shortly afterward, new blades of grass began to emerge. I continued weeding throughout the summer but the number of bags quickly decreased. The following spring I was rewarded with beautiful, green grass and few dandelions. A thick, healthy lawn is the most effective defense against weeds. Since weeds are ever present in the soil, the best way to fight garden weeds is to prevent their seeds from germinating. 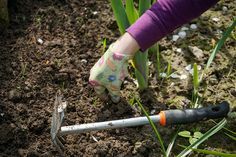 If you are designing a new garden or replenishing an old one, you may be surprised to find a thick layer of new soil will block out weeds. You will also find the garden hoe is the best tool for weeding around young bedding plants. Without a doubt, mulch is extremely effective in preventing weed germination. It also has the added benefit of retaining moisture in the soil. Vegetable gardeners find it best to start transplants weeks or months before planting outside. This is not just for achieving an earlier harvest — larger plants compete better with weeds and mulch can be applied earlier. If you plant seedlings, you must wait until they germinate to apply mulch as they will otherwise have difficulty competing with faster growing weeds. Organic mulches include leaves, grass clippings, compost and straw. Dry leaves and grass clippings spread more easily than wet material and can later be worked into the soil. If using straw, try to find clean straw without a lot of grain seed. Avoid using chemically treated organic matter in vegetable gardens and remember to apply mulch thick enough — approximately 2-3 inches — to prevent weed seed germination. Another option is plastic film, which suppresses weeds and has been shown to increase tomato yields. White film reflects light, but if it is black underneath, it will suppress weeds. Since most plastic is impermeable to water, you should place a soaker hose or drip system under the film. Regardless of which method or combination of methods you use, you will save time in the long run if you are persistent and destroy weeds when they are small.